Looking for an electrician in Plettenberg Bay? Looking for an electrician in Plettenberg Bay? You have come to the right place! Here at Global Electrical and Plumbing, we offer a comprehensive service, whether it be maintenance or bespoke construction or alterations. With many years experience as an electrician in Plettenberg Bay, and 12 years experience abroad on both residential and industrial projects, we are able to provide a reliable, modern and professional electrical service. Have you ever been let down by an electrician in Plettenberg Bay? With us, as your electrician in Plettenberg Bay, you are in safe hands and can rely on us today, tomorrow and in the future. We are a locally grown and established business which aims to forge strong and lasting relationships with our clients, suppliers and co-contractors. Due to our intimate relationships with our suppliers and co-contractors, you can rest assured that your next alteration or construction project will be delivered on time, on budget with the utmost quality and professionalism. Our preferred suppliers such as First Electrical and Transform Electrical have a solid nationwide base ensuring we source the highest quality materials at the most competitive prices. Our clients benefit from these strong relationships with our supply partners resulting in cost-savings and the best quality. As an electrician in Plettenberg Bay, we are acutely aware of some of the challenges faced in this particular area. Not only does the coastal weather have a more profound effect on electronics and electrics in general, meaning it is essential to regularly check and test our appliances, our installations and sometimes undertake preventative maintenance, but also due to the seasonal nature of many properties in Plettenberg Bay, many problems only come to light when owners and visitors arrive to enjoy their holiday. The last thing one wants when on holiday is electrical issues, therefore regular maintenance check-ups are highly recommended. 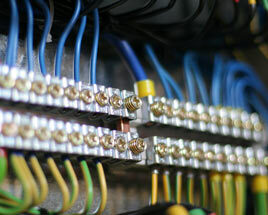 We are skilled and experienced in all facets of your electrical needs. We strive to be your preferred electrician in Plettenberg Bay for all maintenance, alterations, construction and installations. There is no job to big or too small. We are very happy to do a no-obligation quote on any electrical requirements you may have. Call or enquire with us today to ensure your peace of mind and wallet for your next electrical project.